Are you searching for TMJ help that is conservative and gentle? Have you bounced around between healthcare providers and still have pain and discomfort? We oftentimes meet patients that have suffered for years without getting help. Many patients see their primary doctor, general dentist, neuromuscular dentist and/or an EENT before a friend or family member mentions upper cervical care to them. The symptoms can vary making misdiagnosis very frequent and common. Most patients don’t think about their skull when they are having TMJ pain and symptoms. However, the upper jaw is attached to the skull. The lower jaw hinges open and closed by the temperomandibular joints. When there are problems with one or both of these joints, you get a variety of symptoms that affect eating, chewing, talking and even swallowing. At Intouch Chiropractic we take specialized x-ray images to study the alignment of your skull in relation to your body. 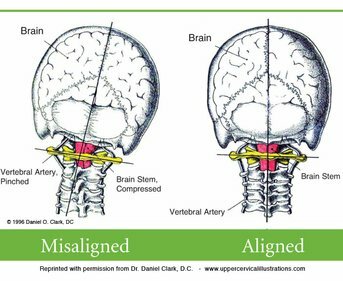 If your skull/head is tilted and out of place, it will affect your jaw and your TMJ indirectly. We look to get your head on straight so that when you open and close your mouth, you upper and lower jaw are in the optimal position alleviating the symptoms of TMJ. With NUCCA | Upper Cervical Care protocols, we help TMJ patients get relief without medications, night guards or surgery. Stand in front of the mirror and tap your teeth together. Now, tilt your head and tap your teeth together. Do you feel the difference? The position of your skull/head affects how your upper jaw and lower jaw function. Having your head on straight is critical.